This Asus X555LA-SI50203H appears to be one of the best deals going for this money. With similar specs, include processors, and memory, I haven’t found any laptops that come close to this, have looked around. I currently have an AMD desktop, and want to replace it with a laptop, this Asus X555LA has a Intel Core i5-5200 processor, the benchmark test result has better result than an AMD. Is it a powerful laptop out there that you can compare to a 1000 bucks laptop like this? Surely, no, but it will be hard for you to find any similar laptops that comes close to Asus X555LA-SI50203H. At this price range, you will usually sacrifice a lot of things. This laptop has an optical drive. For the money, it is an accomplishment, as this device is incredibly thin. I am not a high demand computer user, while I obviously fancy a lightening fast processor powered laptop, but this laptop does just fine. Now, if you are a gamer or regularly running demanding programs, you will want to look for more power computer. 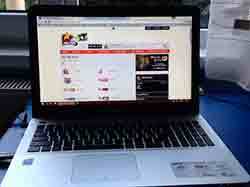 Asus X555LA SI50203H Review – Concerns? No SSD. The hard drive, even though is a huge 1 TB storage, but it runs on 5400 RPM. If you have used an SSD computer before, you will notice why SSD powered laptops are expensive. However, it is not a big negative. I also admit, that I am not a fan of the keyboard. I think it works fine, but my older HP laptop has slightly better one. It is definitely not terrible. From the thin factor, and the price, this Asus X555LA-SI50203H has better speakers quality than I expected. Compared with my older laptop, the speakers are superior. I have to point out, that this Asus – X555LA-SI50203H is a decent looking device. Of course, you cannot compare it to Macbooks, but for what I paid, I am pleased with it. And by the way, for me, the decent looking is a bonus. This said, what it can do is the priority. With Intel Core i5, and 6 gigs of memory, these specs are on the top compared with other laptops in this price. Boot time isn’t as fast as an SSD powered laptop but can reach funtional state max. In 50 seconds. Another positive point of this Asus X555LA-SI50203H is it comes with minimal bloatware. The Windows 8.1 Operating System is pre-installed, I suggest you to update to Win 10 immediately when you get it, check on this tutorial for this, a trial of Antivirus, and a DVD setup utility, that’s it. No other additional trial software,90 days this or that trial, nothing. I think every new computer should come like this, minimal bloatware. The Asus X555LA SI50203H battery life will give you about 4-5 hours per full charged, if you use the laptop in basic state, for more intensive tasks, you will get less battery life, just like another laptops. This place for lowest price. For a sub range Windows laptop out there, this Asus X555LA-SI50203H is hands down the best, so look no further if you need a new capable laptop and don’t want to spend a lot of money.